Elleese touched the bruise on her cheek, which was still tender from last night’s beating, and gazed into the well, wondering if this was the day she’d throw herself in and end her life. It was a lonely old well, made of crumbling, vine-covered stone blocks, lost in a deep valley amid grassy hills miles from town. It was the perfect place for a quiet death. “My weeping well,” Elleese said aloud. How many tears of hers had it tasted? A blanket of gray hung in the sky, with darker, angry-looking clouds to the west, and a light rain that was more like a mist caressed her skin. How many days had she come here with bruises on her face and arms? Once, she’d even showed up with burn blisters on the backs of her hands from a hot poker. She still bore the scars. How many times had she thought about leaping into the well and ending her misery? In this land, where women were all but slaves and the laws worked against them, there was no escape from her husband other than death. The laws of marriage were strict, and any woman who broke them was considered the scum of the earth and could be punished by torture or execution. She had nowhere to go and no one who would help her. Even her own relatives would have turned her away. “I’ll leave all of them to wonder what became of me,” Elleese whispered, climbing up onto the rim of the well. The water below was lost in shadow. Her husband would never find her body here. He didn’t deserve to find her. Let him keep searching and searching, wasting his time and feeling miserable. Meanwhile, she’d be sleeping peacefully in the darkness below. Yet according to the religion that was widely practiced throughout the land, she’d be suffering eternal torment at the hands of demons in some forgotten hell. It seemed unfair that a soul who was already suffering should then be punished by more suffering. But that’s what her people believed. Elleese prepared to let go and fall, but her body refused to cooperate. What if it was true? What if she would end up at the mercy of demons? “I don’t believe it!” she cried. She was tired of living, deep down to her bones--tired of the constant fear and torture. She saw no future for her other than misery, and she wasn’t going to let religious fears stop her from ending her life. She begged her god to have mercy on her soul, and she leaned farther out over the well, relaxing her grip. Still, she didn’t fall. Elleese was about to climb down and return home, when the weeping well itself decided the issue for her. The stone block she was sitting on finally crumbled and gave way. With a cry, she toppled into the darkness. Elleese tried to grab something but fell too quickly, splashing into the murky water and going under. She flailed around and swam to the surface, gasping for breath, her chest tight with panic. Even though she’d been contemplating suicide, it hadn’t been her decision to fall, and instinct and panic now commanded her to fight for her life. She swam to the stone blocks and tried to climb up. It was a shallow well--only about thirty feet deep; but the bricks were covered in a thick coating of slime, and she could find no toe hold even after she kicked off her shoes. “Help me, someone!” she screamed again and again. But she was miles from town or from any road, and she doubted anyone would hear her. Now that death was staring her in the face, Elleese realized she wanted to live. She suddenly knew her destiny, as she gazed up through the tunnel of stone blocks at the gray sky above. She would champion the cause of justice for women and lead a revolution. Or she’d die trying. If she was strong enough and clever enough, she could do it. Many others felt the way she did, and they could meet in secret and plot change. Why hadn’t she thought of this before? Why now, when she was trapped in the well? Regardless, Elleese had received her wake-up call, her true purpose in life, and she wanted desperately to live. Fate was mocking her, and it wasn’t fair. Her destiny had been revealed--but only when it was too late. Already she was growing tired of swimming, as she wasn’t particularly skilled at it and she was expending way too much energy flailing about. She began to sob in frustration, her tears dripping into the water. Something slimy rubbed against her skin and she screamed. Something huge and alive was moving in the dark water--a serpent that rose from the depths and coiled around her. Its head was twice as big as that of a horse, and it was the ugliest thing she’d ever seen. It was a wart-covered mass of uneven, gray scales, with crooked fangs hanging from its jaws. Everything about the serpent was twisted, slimy, and ugly--except for its eyes. They were sapphire blue and sparkled hypnotically as they met her own. Elleese screamed and fought to escape, but the serpent’s tree-trunk thick body was coiled tightly around her. “Let me go!” she pleaded. She wondered if she was already dead, if this was a demon come to torment her. It sure looked like a demon. Actually, it looked far more ugly and monstrous than any demon she’d ever imagined. “Please, let me go!” Elleese cried. Elleese considered it. She’d thought about murdering her husband many times, but she’d always feared being found out and punished. And the punishment for a wife slaying her husband would be a long, slow death in a reeking dungeon. But could she really bring herself to kill him? She doubted it. The serpent bellowed an angry hiss. “You waste my time. I’ll take you down to my lair and devour you.” With that, the monster started to drag Elleese below the surface. Wanting only to escape the abomination that was coiled around her, Elleese reached into the serpent’s mouth with a trembling hand. “Don’t prick your skin!” the serpent warned. The serpent rose out of the water, and she realized it was much larger than she’d assumed. It shot up fifty feet, carrying her in its coils, and dumped her out of the well. She lay dripping in the grass, as the beast hovered above her. “What if I can’t do what you ask of me?” Elleese said, knowing it was a real and likely possibility. “Then you must return here for punishment,” said the serpent. “I may devour you, or I may spare your life--depending on my mood. But regardless, I want my tooth back, as it contains powerful magic.” With that, the monster sank back into the well. Elleese halfway hoped her husband Huen would beat and humiliate her like usual to make the murder easier for her to commit. She almost prayed he’d pull her hair and shove her against the wall while telling her she was worthless--one of his favorite pastimes. But Huen didn’t assault her every night. Rather, it depended on his mood and whether he was drinking. Sometimes he could even be kind and gentle. On this night, Huen was in a gentle mood. He apologized for hurting her the night before and told her he loved her. He was tired from work, and turned in early. Elleese stood in their home, the serpent’s tooth pinched between her fingers, wondering what she should do. At last she walked upstairs and into their bedroom. Huen lay sleeping peacefully on the bed. He looked so innocent, a tall, lanky man with dark hair and a thin, young face. It was all too easy to forget how that boyish face could become contorted with rage, how those big, calloused hands could squeeze her throat. Tears rolled down Elleese’s cheeks. She couldn’t deny that she loved him. If only he could change and lose that terrible temper, they could have a happy life together. Sometimes he could treat her like a princess (usually when he was trying to win her affections back after knocking her senseless). She knew he was capable of being a sensitive, loving man. “I can’t do this!” Elleese whispered. Huen groaned and rolled onto his side. For an instant he scowled in his sleep, and the memories of years of cruelty flooded her mind. She raised the tooth, rage boiling inside her. One tiny poke from that tooth and he’d get what he deserved. And she’d be forever free of him. Elleese moved to the bedside and positioned the tooth an inch above his cheek. She was seconds away from freeing herself from a monster’s grasp--or rather,two monsters’ grasps. But still she hesitated, unable to force her hand to move. For several minutes, she fought an internal battle with herself. The tooth she held poised above his flesh was the key to her salvation. Or was it? She’d never hurt or killed anyone before, and she knew if she did so now, that would make her no better than her husband. He deserved to punished, but not like this--not as he lay sleeping. Elleese knew she was doomed. She couldn’t sacrifice her honor and do what the serpent wished. But if the creature spoke true, she’d have to return its tooth or it would bring destruction to her and her family. Regardless, she was no murderer. And even though she knew must return to the well and probably be devoured, she could take some solace knowing she was a better person than the sorry wretch whose life she’d just spared. She turned away from her husband, believing she’d never have justice--that he’d never be punished for all the misery he’d inflicted on her. Was she a complete fool? She leaned against the wall, clutching her hair. Was she giving up a great opportunity in favor of more suffering? 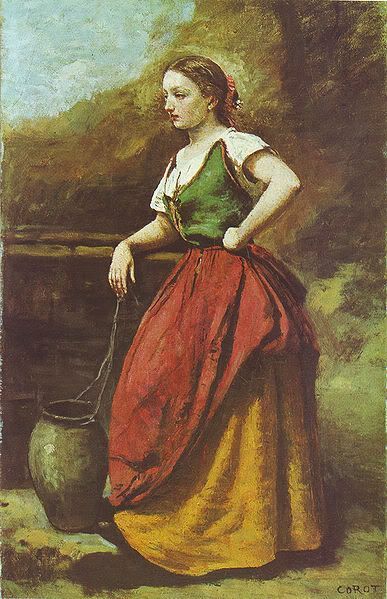 She wished she’d simply drowned in that well--like she’d wanted to for weeks and weeks. The next day, the rain had stopped but purple storm clouds hung in sky. The sun’s rays poked through, and a huge rainbow stretched over the land. The hills around Elleese were bathed in a golden glow. She stood before the well, gazing into its depths, wondering if the serpent would show itself. The creature disappeared back down into the well. Elleese waited, her body shaking. She could scarcely imagine what dastardly fate awaited her. Was her honor worth this? But that question had already been answered when she made the decision to spare her husband’s life. Moments later, the serpent rose again, but it had changed. Instead of a warty gray covering, its scales were now like the finest silver and shimmered with a touch of crimson. Its head had become proud, stately, and dragon-like, with three magnificent gleaming horns jutting forth. The creature had transformed from the most ugly monster imaginable to a beast of breathtaking beauty. From its jaws, it dropped a golden chest into the grass. Elleese gazed up at the serpent in shock, unsure of what to do. Was this really happening? “But you wanted me to murder for you,” she said. “Worthy to command you?” Elleese said, her disbelief growing. “Look in that chest,” the serpent said. With trembling hands, Elleese pressed a button and the chest popped open. Inside was a golden breastplate, a winged helm, and a silver bow and quiver of arrows. All were covered in runes and shone with a magical glow, beautiful beyond anything she’d ever seen. Elleese did, and it fit perfectly. She slung the quiver of arrows over her shoulder and grabbed her bow, a deep change settling over her. Her eyes became sapphire blue, her will strong with purpose. The woman she’d always been deep inside had sprung into bloom. The serpent lowered its head. She caressed the serpent’s neck, feeling a deep bond with the creature. At last she climbed onto its back. Robert Keller says: I've always loved fantasy fiction, and I grew up on traditional works like those of J.R.R Tolkien and Terry Brooks. I live in Northern Michigan surrounded by lots of forests, lakes, and rivers--all of which help inspire many of my story settings. I've been writing a lot lately, and I'm hoping 2009 will be a very productive year. My advice for other fantasy writers is to never forget that "magic" is what makes fantasy great. Magic is what sets fantasy apart from other genres, and it's important to really try to bring that to life in a story, to inspire longing within the reader to live in the world you create. I enjoyed this story; the difference between good and evil sometimes has to be searched for.